Alright, here's a tape we DIDN'T sleep on, but on that has still instilled a significant amount of regret around the CCPS offices. 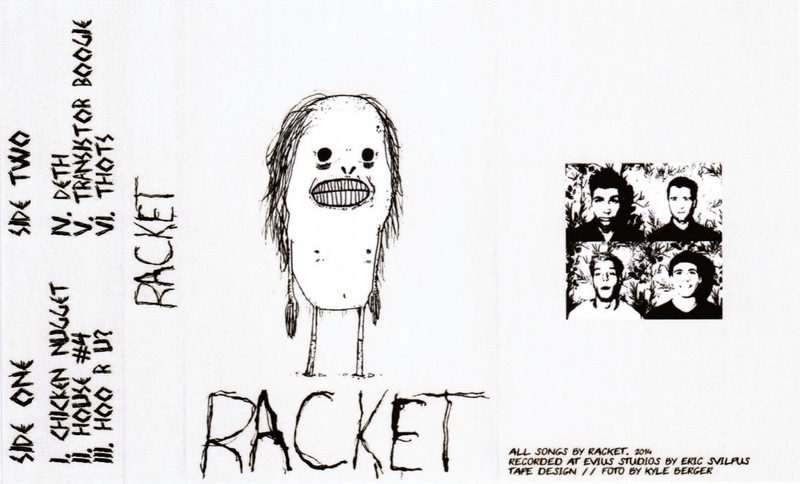 We decided not to go to Racket's cassette release show at Tubby Dog earlier this month, and thought we were being all smart and everything when ordered a physical copy of their tape from bandcamp. See, Gene though he was being smart and rewarding the band for actually selling their tape, and not just their mp3s. Instead, we may have inadvertently added to the losing battle that is garage rock. When the tape arrived, it shows that the postage cost, uh, more than we paid for the tape AND postage. So, uh, chalk up another loss leader. We'd like to take this opportunity to formally apologize to Racket for contributing to their downfall. That said, we're very happy with our purchase. This is a really well-packaged bunch of garage rock, the kind that makes Gene reach for the volume knob (and turn it clockwise, instead of anti-clockwise). It looks like the Racket guys are playing PMMA's tour kick off in a few weeks, so Gene has vowed to possibly sleep through that show as well. In the meantime, we urge you to pick a copy of this tape up from Sloth or Hot Wax, and to buy their mp3s off bandcamp. But please think twice about buying a copy of the tape off bandcamp.